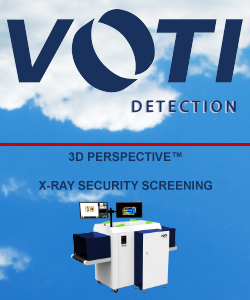 VOTI DetectionTM, a leading detection company employing breakthrough 3D Perspective technology to deliver enhanced threat detection, today announced that the Transportation Security Administration (TSA) has granted the VOTI XR3D-6D X-ray scanner acceptance onto the “Approved” section of the Air Cargo Security Technology List (ACSTL). The product was previously qualified by Transport Canada in 2017. By providing patent pending 3D PerspectiveTM and associated enabling technologies to operators, VOTI DetectionTM scanners deliver remarkably sharp and more revealing images than traditional X-ray screening technology as well as threat alerts, material classification, dual energy imaging, the ability to manipulate and enhance images and more. SecuritySolutionsWatch.com:Thank you for joining us today, Rory. Before we drill down into VOTI DETECTION™ solutions, please tell us about your background and management team . May we also have a brief company history? Rory Olson: Thank you, it’s a pleasure being here today. I have been an executive with more than two decades of industry experience in technology businesses ranging from startups to mature multi-billion dollar enterprises; in industries ranging from online payment processing to mobile entertainment. At VOTI Detection™ we have been very fortunate to have assembled an “A-Class” team of entrepreneurs with over 190 years of public and private company know-how! Built on an absolute requirement of respect, management promotes open and honest communication, across the organization to promote efficient interaction between internal and external clients, allowing us to best serve our customers. VOTI™ Detection’s commitment to innovation is found in the corporate culture of continuous improvement. Our company was founded in 2008 with the mission of saving lives, protecting people and assets through enhanced detection of threats and contraband. We are trusted around the world, servicing critical industries in over 45 countries with our superior 3D Perspective™ technology. Rory Olson: Today our XR3D platforms of security screening scanners are deployed globally, where we focus on attractive markets such as, securing perimeter and buildings, public safety and transportation. Our family of single and dual view products are easy to use and provide the clearest, most accurate screening available in the market. We offer a full range of tunnel sizes to best fit the use of our customers to their intended needs. In addition, all our products are designed in compliance to international safety standards and regulations and easily integrate into larger security applications. Our 5 Series is our most compact solution; ideal for mail, small parcel and small baggage screening. As these systems fit in smaller areas they work perfectly for critical infrastructures, transportation and border security allowing small bags and mail items to be screened quickly and effectively. Our 6 Series is our best-selling line for a reason: these systems are a great fit for most use cases and easily accommodates mail, parcels, and small to medium sized purses, messenger bags and carry-on luggage. So, they work great for critical infrastructure, transport, correctional facilities, as well as retail and manufacturing for employee screening. The 7 Series is perfect for screening the largest carry-on articles, as well as mail, parcels, and personal items. As such, it works well for security screening passengers in airports, train systems, and for critical infrastructure like courthouses and government facilities where items need scanning, both large and small. Our 10 Series systems are large scanners that are ideal for check-in baggage screening, freight screening at warehouses, fulfillment centers as well as ports and borders. Our largest scanners, the 18 Series , are perfect for industrial use in transport, ports and borders, or retail and manufacturing where cargo, pallets and shipping containers need to be screened without opening individual items. We even have a Mobile Series which are customizable to fit on vans, trucks, trailers, and other forms of transport. They are best suited for situations where scanners need to be deployed quickly, temporarily, or across a large area. These systems scan items up to check-in sized baggage, and work well for security operations, events like conferences, and border patrol units. SecuritySolutionsWatch.com: Are there any new features you would like to highlight? Rory Olson: Whether scanning mail and small parcels, or larger baggage, cargo and freight, our XR3D solutions are specifically designed to provide clearer and more revealing images using our 3D Perspective™ technology. Our equipment and software are easy to use and highly customizable, our remote diagnostics and surveillance significantly reduce downtime, and our raw image processing provides centralized security screening, archiving and the possibility for future scanning review. These features help give our clients the peace of mind that comes from choosing the best detection solutions available. SecuritySolutionsWatch.com: What is your perspective Rory regarding VOTI’s unique value proposition and the advantages VOTI delivers vs. other players in this highly competitive space? Rory Olson: Unique to Voti Detection is that we are bringing technology and product innovation to an industry that has not seen any in over 50 years with our 3D Perspective™ high resolution image and industry leading clarity at a much lower cost for our customers to buy and maintain their systems. With our higher image resolution and sharper contrast, on top of the greater depth of visibility, we allow operators to see what they need to see much more quickly. By eliminating blind spots we enable operators to make better decisions. They can analyze images more easily to make confident and rapid decisions, whether on the floor or in a security center. Because we archive the original source files, our customers can rescan any stored image virtually for additional analysis, as though the object was being processed for the very first time. In addition, we provide comprehensive management capabilities which includes archive management, network integration, multi-language options and the ability to configure administrative parameters. Our innovative design and detection capabilities are made possible through our state-of-the-art operating system, BioSans™. Our OS provides the core software needed to facilitate the 3D Perspective technology that makes our systems consistently outperform all others. Through BioSans™, we can add additional applications and modules to extend the functionality and value of your equipment. From detecting precious metals, to threat image projection, all of our proprietary apps run through BioSans™. Our software is our greatest value-add and provides many scaling opportunities for future innovations, especially in AI, machine learning and analytics. SecuritySolutionsWatch.com: We read with great interest on your site that, “In line with our mission to ensure top security readiness, at VOTI™ we make sure our clients can use our products to their greatest potential. This means that we have made it our responsibility to offer a full-range of product instruction options. Offered either on-site or at VOTI’s headquarters, our multi-module courses are taught by highly trained and experienced professionals and will be tailored to meet your organization’s needs”. VOTI high technology certainly enables the ability to make critical decisions…faster. And at the end of the day, it’s “people” who make the difference saving lives. Care to elaborate on VOTI Training and Support? Rory Olson: At Voti Detection we understand that beyond developing the most advanced security screening systems in the market, we need to provide effective support, servicing and warranties to keep our customers operations running smoothly. We have multiple training, service and support offerings for our customers to choose from, as well as comprehensive documentation including operator training, maintenance manuals and product specifications. Some of our support offerings include; 24/7 customer support where we provide Level 1, 2 and 3 customer support, with around-the-clock help desk services from knowledgeable and experienced technical support staff. Remote servicing; VOTI’s systems require far less maintenance and servicing than usual, due to our simplified hardware setup and sophisticated software allowing us to diagnose and address issues remotely, faster than other providers. This results in less downtime and fewer idle machines waiting for repairs. Also, we offer several different service support bundles and packages through VotiOPTIONS™ to address our customers unique support, warranty service and training needs. VotiSTART™ to help install and commission new systems to get everything up and running smoothly. VotiCARE™, adds emergency servicing, diagnostics, and engineering support and VotiEXTEND™, providing extended warranties on any of the systems to safeguard the equipment beyond the standard warranty term. With regard to training we offer VotiUNIVERSITY™ our multi-module course options, delivered either on-site or at VOTI Detection’s headquarters, and are taught by highly trained and experienced professionals who tailor the courses to meet our customer’s needs. SecuritySolutionsWatch.com: Can we discuss your key target markets for a moment? In today’s constant threat environment, assuring security for parcels that are in transit could hardly be more challenging. Want to discuss some VOTI success stories in the field? Rory Olson: As I mentioned previously, critical infrastructure, transportation, ports and borders, law enforcement, correctional facilities and military, manufacturing and retails are key target markets for Voti Detection. We have numerous success’s addressing these markets. For example; In Turkey, we have secured all entrances and exits of the Ankara Metro stations with our XR3D-60s platforms to ensure the safety of all passengers by detecting potential threats. In Canada, our systems are being used by the province of Ontario in their correctional institutions to detect potential contraband incoming and outgoing. Similarly, in the USA, Amazon fulfillment centers are utilizing our screening scanners at all their facilities exits to screen for security and loss prevention. This is an upgrade to their current process to improve the exit screening process for their employees enabling faster screening and less invasive experience. In Indonesia, our platforms our being used in all government applications; military, police, court houses and correctional institutions. A key retail Jeweler, in the USA, uses our Precious Metals Detection application (VotiPMD™) with their systems, installed in all of their warehouses, to detect any type of precious metal that may be exiting their facility as a loss prevention measure to protect their assets and stock. As you can see, there are many use cases and successes for our product. SecuritySolutionsWatch.com: Las Vegas unfortunately reminds us how vulnerable we are. In your opinion, Rory, do you envision more screening at hotels of bags, luggage, and parcels, at check-in? Is the US trailing behind Europe in this regard…your thoughts? Any other trends you’d like to talk about? Rory Olson: Yes, Las Vegas was a terrible tragedy and does trigger additional discussion on security, especially for protection of people and saving lives. There is no doubt in my mind more screening in public and private physical entrances and exits will be required and mandated. Other countries, enterprises and communities outside North America are already taking the step to enhance their security. In many regions of Europe, Africa and the Middle East, hotels, public facilities such as shopping malls, museums, sports venues, concert halls, etc., have x-ray scanners deployed. Asia is following and I expect North America will not be too far behind. As more awareness is given to the role of x-ray scanners in these domains, AI and analytics will be play a key role in the automation and predictive detection of threats to all. We understand the need of our customers to automate their detection capabilities with the goal of simplified operations and cost reduction. Key trends will be to leverage AI, machine learning and data analytics, to dynamically store the data, synthesize the data, and provide insightful information that can be acted upon manually, or by a machine to respond accordingly to a threat with the appropriate decision. The end goal is to provide a better customer experience with operational efficiencies and cost savings. SecuritySolutionsWatch.com: Congratulations on the recent award from The Deloitte Fast 50 program in Canada. Please tell us more. Rory Olson: Yes, we are extremely proud and excited to have received a Companies-to-Watch award in the 2017 Deloitte Technology Fast 50 Awards. The award recognizes companies with strong growth potential and honors the companies that demonstrates promising potential to be a future Technology Fast 50 candidate. We credit our innovative 3D Perspective technology and its software first approach for our company’s record growth this year, which greatly exceed the industry growth rate. What’s truly satisfying as the Companies-to-Watch winners are recognized as a class of companies that possess effective management experience and superior technology. SecuritySolutionsWatch.com:Thank you again for joining us today, Rory. Are there any other subjects you would like to discuss? Rory Olson: Thank you. It was great having the opportunity to be part of your “In Boardroom” series, discussing Voti Detection, our products, markets and successes. We are very excited to be making a difference in the global security market, with a team of experienced innovators and entrepreneurs who are bringing distinctive products and technology to our customers and delivering strong business growth to our stakeholders. Our mission is saving lives, protecting people and assets through enhanced detection of threats and contraband.